Courtesy of Michael McCarthy . 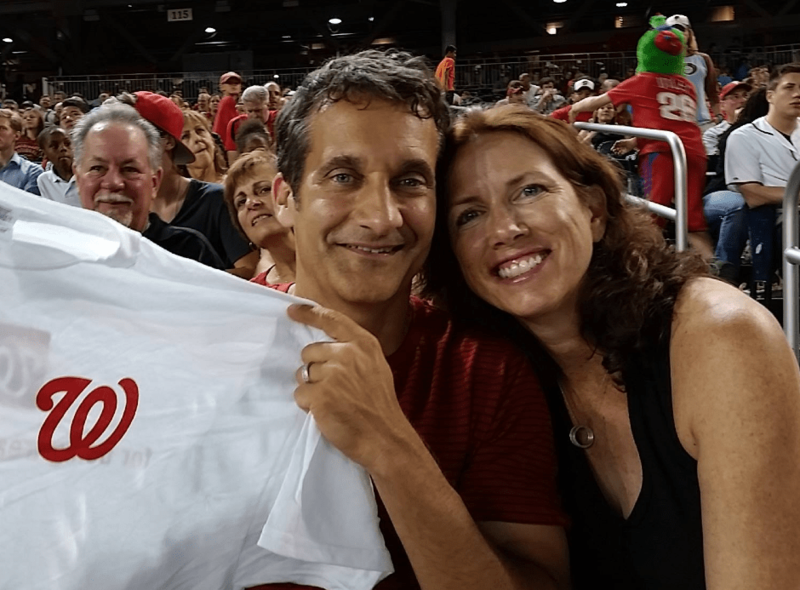 Michael McCarthy and his wife, Maureen, attend a Washington Nationals game. When he was a boy, Michael Anthony McCarthy dreamed of being the shortstop for the Los Angeles Dodgers. A shortstop is a defensive baseball player who must swiftly throw the ball to first base to get the other team’s batter out. Long story short, McCarthy isn’t a sports star, but he is a shortstop of sorts. 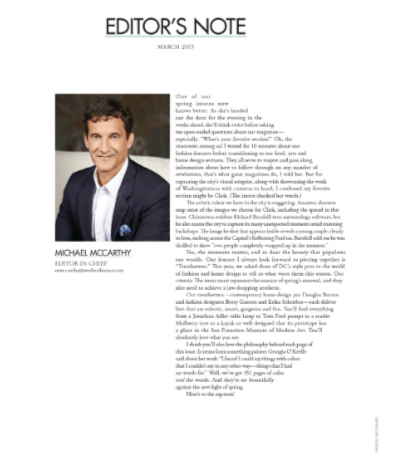 As editor-in-chief of Modern Luxury’s DC Magazine — a lifestyle glossy that covers style, dining, culture, design, travel and high society in Washington, D.C. — McCarthy compares his job to deciding who’s in and who’s out at an upscale club. McCarthy also has to maintain DC’s brand. He cites the March 2015 issue as an example. The cover is dominated by actress Taraji P. Henson, who is starring as Cookie in Fox’s hit show “Empire.” Gorgeous as always, Henson sports an elegant white pantsuit and reclines powerfully across a beige couch. McCarthy’s career didn’t take off right away either. When he graduated from George Mason University in 1986 with a bachelor’s degree in English and history, he tried to enter the workforce with limited success. He was a substitute teacher at Falls Church High School while waiting to be hired, and he got his first writing job in 1987 at the Building Contractors Association International, where he made $20,000 running the trade association’s magazine. Then in 1989, the 25-year-old McCarthy decided to start his own magazine. He and a college friend quit their jobs when they were confident that they could get the advertising for their new publication, Northern Virginia Action Guide. “It was probably the best decision I’ve ever made, but it was probably also the stupidest decision I’ve ever made,” he said with a chuckle. The idea came from his younger sister, who was working part time as a concierge at the Sheraton Hotel in Tyson’s Corner. She said that guests would come in and ask not for information on D.C., but rather for information on Northern Virginia. McCarthy and his partner got to work immediately, writing copy, selling advertising, designing the publication’s layout on a rented Macintosh computer, and delivering magazines to hotels in McCarthy’s Jeep. A man from Arizona purchased the magazine two years after it debuted, giving McCarthy more time to do what he loved—write—but he left soon after because it wasn’t his magazine anymore and all the fun was gone. By the time the magazine folded a few years later, McCarthy was onto his next job. He worked at a variety of places, including the Produce Marketer’s Association, Active Interest Media and Washington Flyer Magazine. He got a master’s degree in journalism from Johns Hopkins before rising to his position at DC Magazine in 2013, but McCarthy learned the basic skills he would need today from the Northern Virginia Action Guide. These days, McCarthy sits in a fourth-floor office in Friendship Heights that’s as filled with pictures of his kids as it is with work-related papers. He spends his days collaborating with stars in the city, people in his office, freelancers, photographers and bigwigs at Modern Luxury’s headquarters in Chicago to produce the monthly magazine that captures the essence of the nation’s capital. And the blue-eyed editor manages it all with impressive grace and composure. Katie Bianco, who has been DC Magazine’s senior editor since January 2013, works closely with McCarthy. They split coverage of the magazine and she says they have a great working relationship characterized by excellent communication and partnership. Maya Allen is an editorial intern at the magazine, and her cubicle is adjacent to McCarthy’s office. She’s glad for the opportunity to pick his brain about everything from magazines to family and life in general. “Open” is a great way to describe McCarthy. He considers himself to be uncomplicated and he doesn’t want to be the mystery “strong and silent” type, he said. Instead, he would rather be easily trusted, a fine aspiration for a writer. His passion for writing can be traced back to his early days, going to work with his father on Saturdays. His father, James McCarthy, was a federal marshal in the District whose resume included working with the Kennedys after the president’s assassination and protecting John Dean, Richard Nixon’s counsel, during the Watergate scandal. On Saturdays, his father would take him to the D.C. Courthouse, a beehive of activity even on the weekends. His father died two years ago, and he gave his father’s eulogy. McCarthy told those attending the funeral that his father made him a writer because everyone was his friend and because he believed that everybody had a story and that the best people had many good stories. 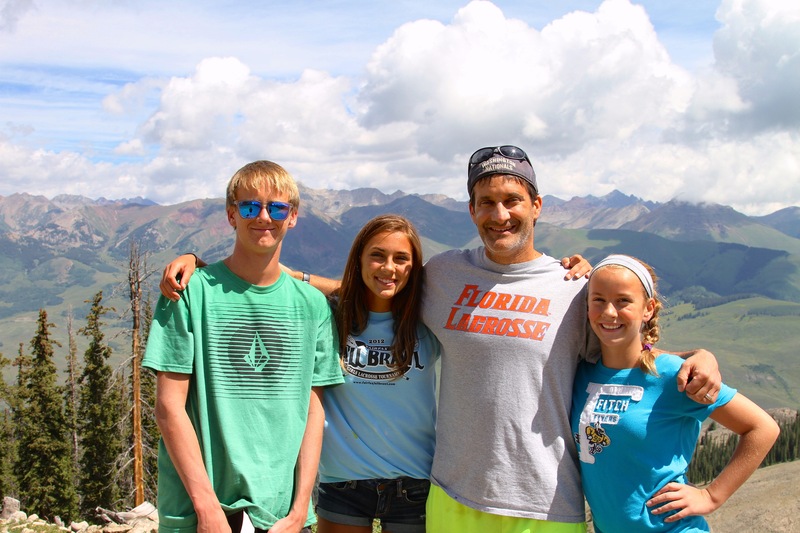 McCarthy and his children in Colorado last summer. From left: Jack, Annie, Michael and Lucy. Family is huge for McCarthy. He inherited his mother’s forgiving, loving and calm temperament, and he started his own family with a beautiful woman named Maureen, whom he met while working for the Produce Marketer’s Association. She left him breathless, literally, when she smoked him in a swimming race. After that, they talked for hours by the pool until the early morning hours. So they kissed, and he knew she was the one he would spend the rest of his life with. Maureen Gargan became Mrs. McCarthy on Aug. 14, 1993, and nearly 22 years later, they have three children—Jack, 18, Annie, 16, and Lucy, 13—whom McCarthy absolutely adores. As they grew up, he coached their baseball, basketball and lacrosse teams. “I spend a ridiculous amount of time with my kids, but I want more because I think they’re great kids and I’m hyper aware of time,” McCarthy said, noting that his son, Jack, is going to college next year. Jack, who plans to study psychology or environmental science at either Randolph-Macon College, Radford University, Longwood University or Washington College, said he will miss hanging out with his dad and talking to him every day. “He shaped me up to face any obstacles,” Jack said, explaining his father’s pervasive social, athletic and academic influence on his life. 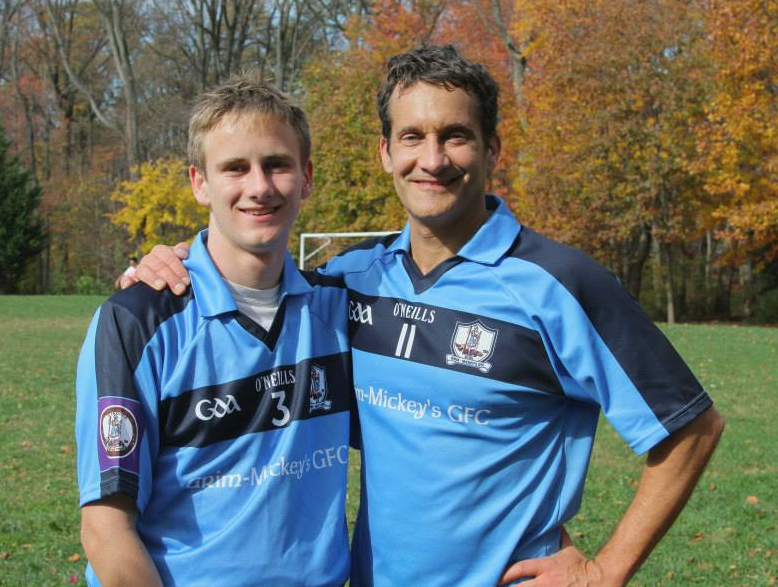 McCarthy and his son, Jack, after a Gaelic football game last fall. The elder McCarthy, who prides himself on the relationship he has with his children, has made carving out time for family a priority, despite working in a fast-paced, deadline-driven industry. McCarthy often leaves the office to have dinner at home with his family. Aside from making time for family, he also competes in triathlons, edits films, shoots photography and keeps a digital journal about his children’s lives. In addition, he devotes each year to a creative endeavor. Last year, he organized a Gaelic football team. This year, he wants to get into podcasting and possibly have his own online radio station. It’s all part of feeding his soul, McCarthy said. “I think you get to the point where you say, ‘these are the things that make me happy,’ and you have to surround yourself with those things. And they could be the simplest things in the world,” he said. McCarthy is a hard worker with excellent time-management skills who stresses to his children how easy it is to be average and how easy it is to fail, but how worth it is to succeed. And above all, he believes humility is important, no matter how successful one becomes. He evidently didn’t let the title of editor-in-chief go to his head. In the right corner of McCarthy’s office, across from his desk, stands a poster for the April 2014 annual Men of Style issue of DC Magazine. It pictures Oscar-winning actor Adrien Brody on the cover, fedora in hand, a symbol of class and refinement. The issue highlights seven other dapper gents who are transforming the District of Columbia. Too modest for self-praise, McCarthy isn’t featured in the magazine. But with a great job, a loving family and an abundance of hobbies, Michael Anthony McCarthy is a true man of style.